Today I was off-campus for professional development related to our district’s Digital Learning Initiative. Given that we ran short on time yesterday, I gave them a more detailed than normal purpose for today’s lab: “Determine the effect on the circuit of adding a second capacitor in series or in parallel (half the groups add in series; half in parallel) to an RC circuit. 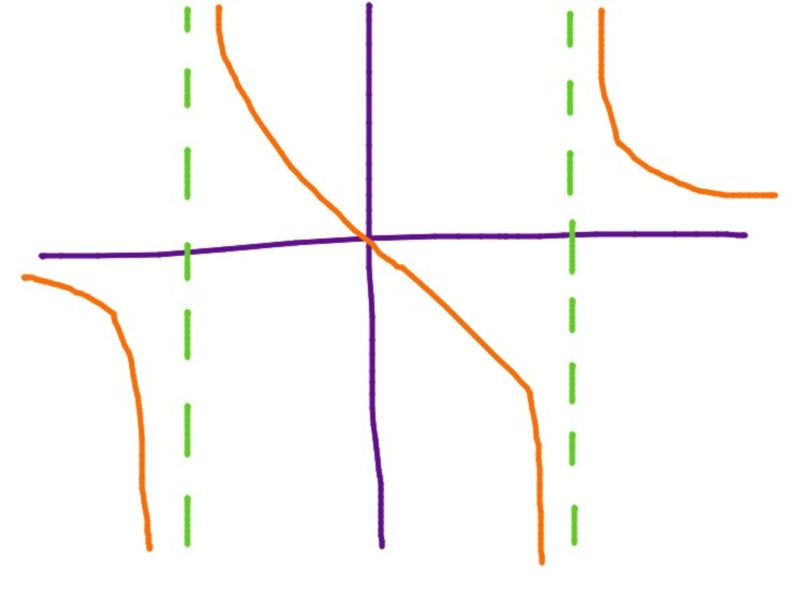 Specifically, graphically and mathematically model the relationship between voltage across the capacitor(s) and time as the capacitor(s) discharge. Extract the time constant from this mathematical model and determine how the equivalent capacitance changes with the addition of the second capacitor.” I left them a demo circuit as well. No frantic emails or messages were sent to me during class, which is a good sign. They left whiteboards summarizing their conclusions in the classroom; I’ll take a look tomorrow during our institute day and see how it went! Today, I introduced RC circuits by displaying the voltage across the capacitor as it charges and discharges. I share that when first-year physics students describe a graphical relationship as “exponential” they usually mean “quadratic.” Today, however, we can use that label correctly! 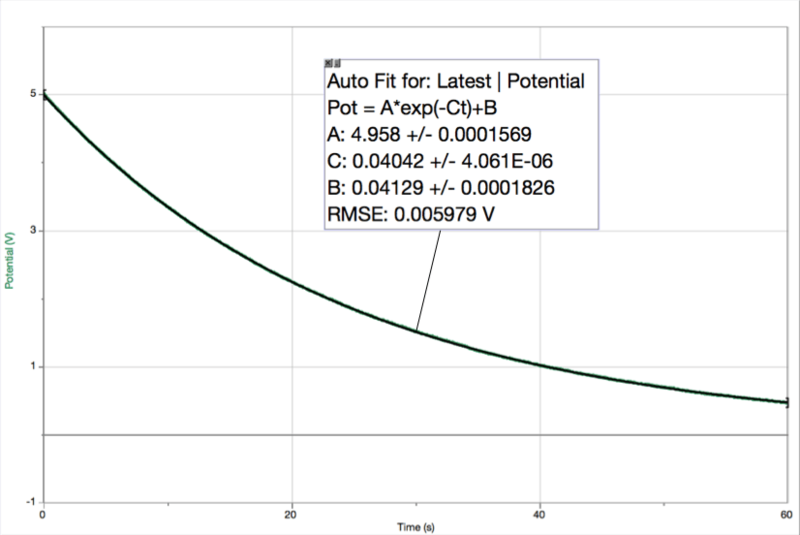 The curve fit for an RC circuit is always fantastic. Unfortunately, We ran short on time today, and students don’t have a strong understanding of what the time constant really means. I won’t be in the classroom tomorrow; so, we’ll see how they do on the activity which is to determine how adding a second capacitor in series or parallel to the first affects the behavior of the RC circuit and how we can model the equivalent capacitance. I still need to finalize the lab practicum for this unit, but I want something involving RC circuits, time constants, and flashing LEDs! I wanted my AP Physics 2 students to review the behavior of resistors in series and in parallel but from a new perspective. 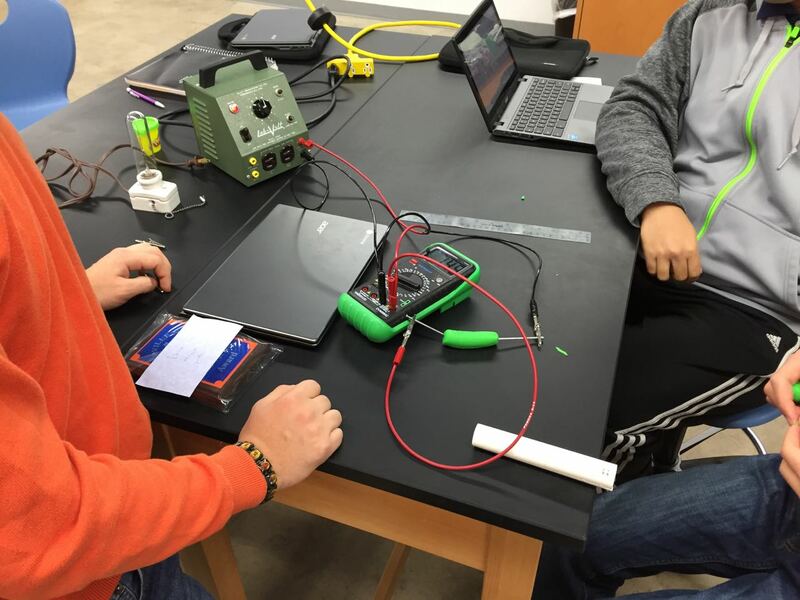 Inspired by the article “Experimenting with constant current and voltage sources” in The Physics Teacher, I provided students with solar panels instead of batteries and had them investigate how the voltage across and the current through the source changes when a second resistor is added in series or in parallel. I told them upfront that the solar cells were constant current devices. I should have left that unsaid and let them come to that conclusion on their own. Regardless, I hope that this introduction to solar cells will provide a hook when discussing the photoelectric effect next semester in our quantum unit. The solar panels only function as constant current sources for a range of voltages and resistive loads. 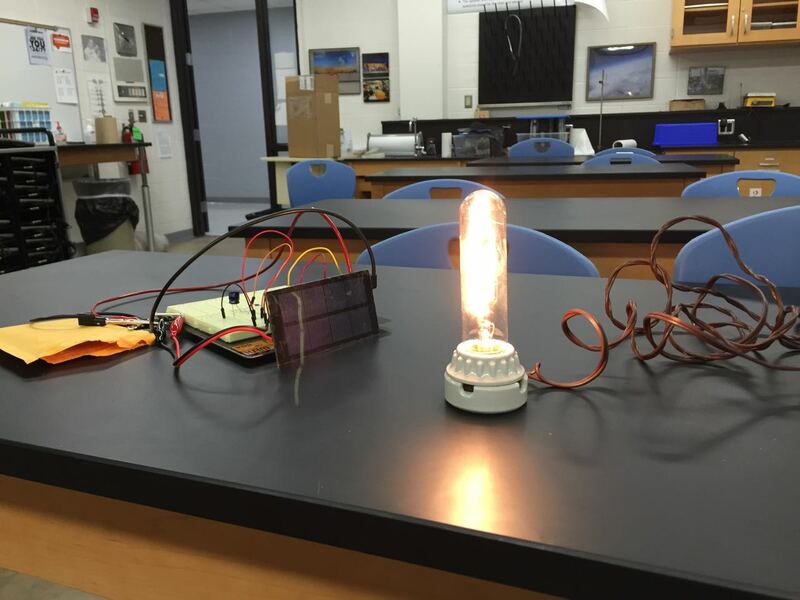 I need to investigate the best combination of light intensity and resistors to improve the outcome of this lab. Those groups investigating the effect of adding a resistor in parallel had good results, but the groups investigating the effect of adding a resistor in series did not. Students agreed that bulb A would again be brighter. 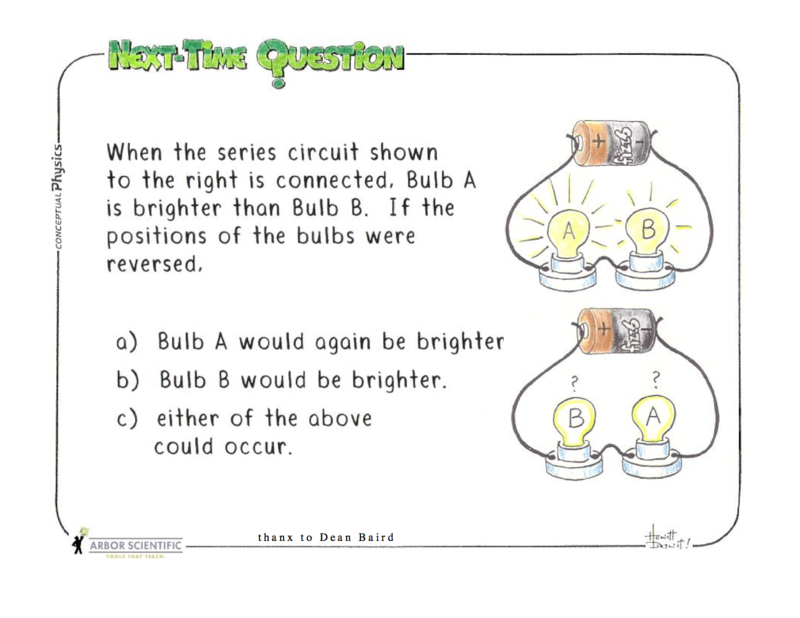 They were also able to justify their answer by stating that the current through the bulbs is the same and the resistance of the bulbs is different. What threw them was when I asked which bulb had the greater resistance. Today, AP Physics 2 students prepared and presented whiteboards on a variety of topics. The problems I selected integrated multiple concepts from previous units as well as the current unit on circuits. I was especially looking forward to one problem on electroplating, but didn’t realize only our AP Chemistry students had done an electroplating lab! After a brief tangent to explain electroplating, we continued with our whiteboards. 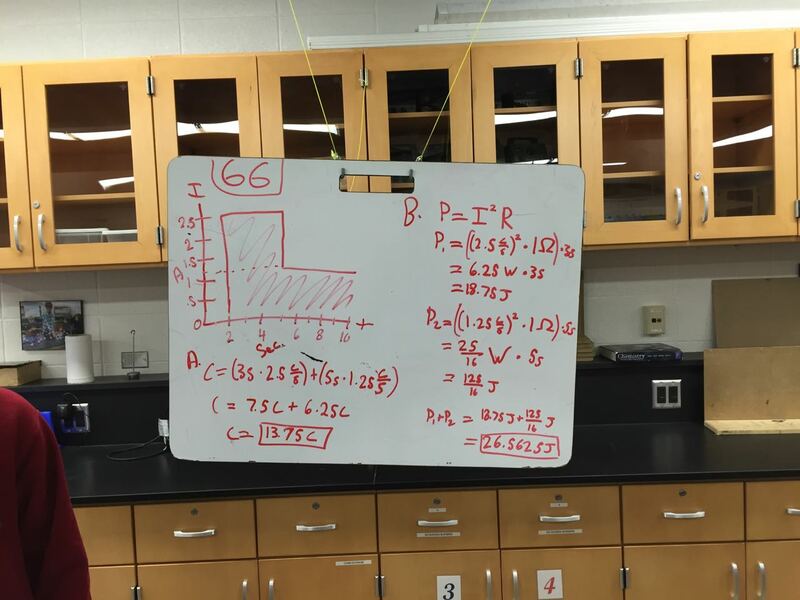 One problem had students analyze a graph of current vs. time to determine the charge. This isn’t a representation that I had used before, and it was good way to reinforce students’ understanding of the relationship between charge and current. Day 61: Resistance Paradigm Lab with Play-Doh! 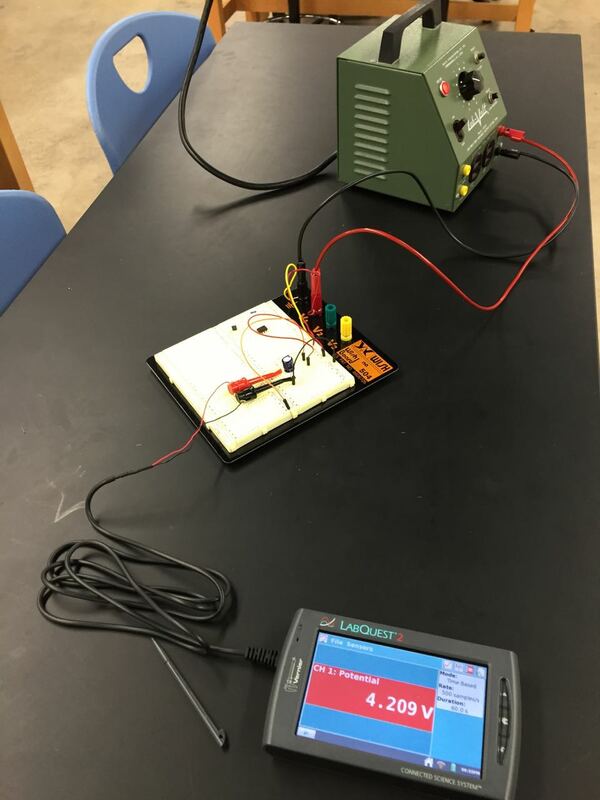 I wanted to do a resistance paradigm lab to start the circuits unit in AP Physics 2. I found a Nature of Resistance series of activities from ￼￼the CLASSE Institute for Physics Teachers. The activities seemed well designed and emphasized the connections between macroscopic observations and atomic interactions. Today, after an introduction with an incandescent light bulb and the standard Modeling Instruction paradigm lab discussion, students focused on graphically and mathematically modeling the relationship between resistance and either length or cross-sectional area of the Play-Doh resistor. The accuracy of the data wasn’t fantastic, but they had a lot of fun and saw the relationships among the variables. Posted on 17 November 2014 2 Comments on Day 61: Resistance Paradigm Lab with Play-Doh! I was out of the classroom today while the AP Physics 2 students completed the electrostatics unit exam. I dug through my photos and found one of a whiteboard from a few days ago that I didn’t use in that day’s post. It is an electrostatics conservation of energy problem. The group that prepared this whiteboard included an energy LOL diagram. I’m thrilled how that particular representation helps students organize their knowledge for conservation of energy problems. I can’t believe it took me so long to integrate them into my teaching! I originally planned a lab where students would explore Millikan’s oil drop experiment by performing video analysis of a recreation of the experiment. 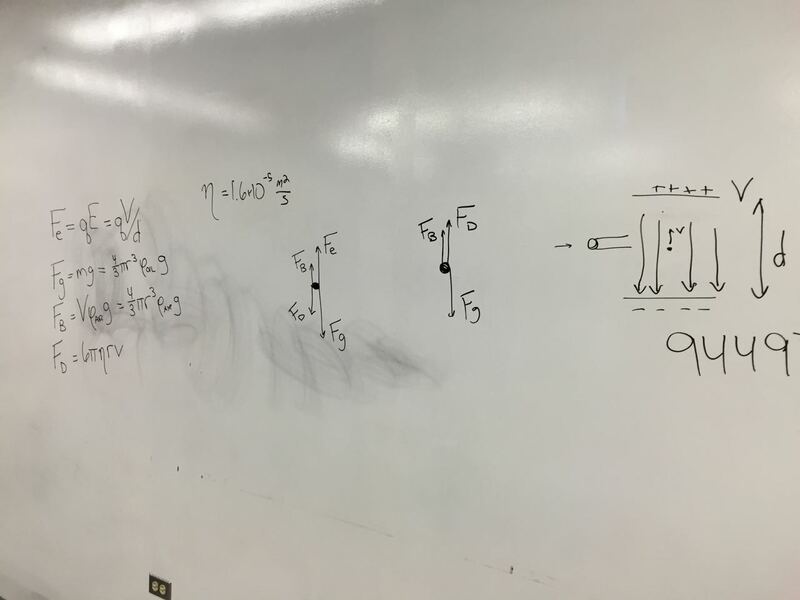 We ended up short on time in this unit; so, I abbreviated this lab into a discussion of the historic lab and a focus on the free-body diagrams. 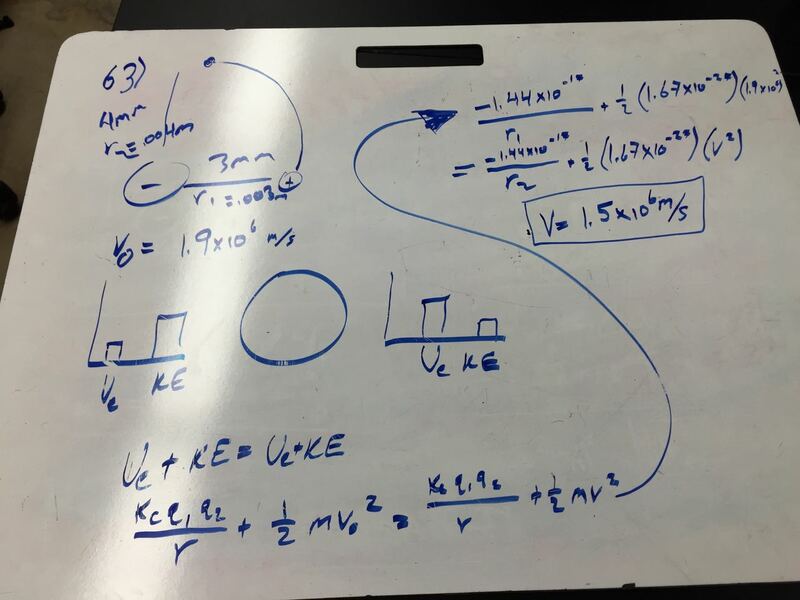 It is a great experiment to explore at this point in the class as it reinforces concepts from fluids (density, buoyancy, and Stokes’ Law), highlights electrostatics, and sets the stage for quantum.